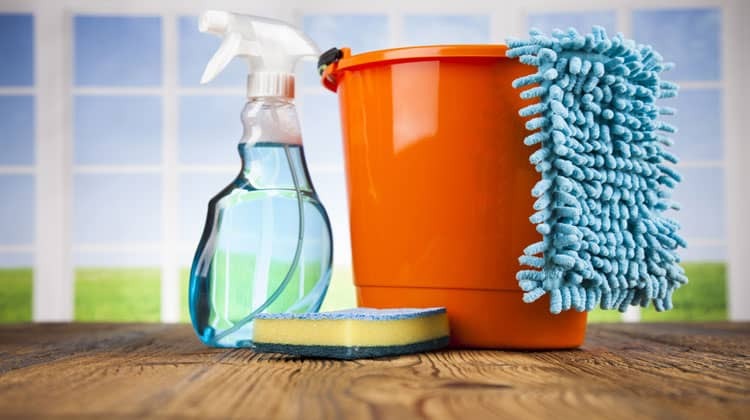 Buying various cleaning products to clean your house can quickly become cost prohibitive. You need a cleaner for the kitchen, then another for the bathroom, then yet another for the living room. And then there are the ingredients. Half I can’t pronounce and almost all of the labels have warnings on them. If they aren’t dangerous, why do we have to lock them up so our kids can’t get to them? Why spend money on countless household cleaning products and risk your health when all you need are 6 basic ingredients? Mix them up the right way and you have instant low cost cleaning product alternatives. Too good to be true? I don’t think so. Here is how to do it. Vinegar: It may smell a little weird, but vinegar can handle everything from dishes to laundry and even weeds. Baking Soda: Eliminates odors and helps with stains. It also works as a natural method for pest control. Ants hate it. Rubbing Alcohol: Works as a disinfectant and is also a great glass cleaner. It also gets grime off plastic and metal surfaces like patio furniture or bathroom fixtures. Lemon Juice: This cuts through dish grease and is an ingredient for homemade furniture polish. But it’s not the easiest thing to preserve long-term. Borax: This mineral salt beats bleach as a toilet cleaner and is also useful for scrubbing walls. Works great with laundry, too. Fels-Naptha soap: This one’s actually made by one of those big cleaning companies out to pinch our wallets. They recommend it for pre-treating stains. In other words, “use this in addition to a bunch of our other expensive products”. But you can turn the tables by using it as part of a recipe for your own laundry detergent. As a bonus side note, you can use Fels-Naptha to treat poison ivy. Simply lather it over the poison on your skin and let it dry. It will dry out the poison! Now that you have the ingredients, what low cost cleaning product alternative can you make? I’ve come up with a list of 12 cleaning products that will help keep the majority of your house clean and smelling fresh. To clean your tile or linoleum floors, all you need are 2 ingredients. Mix them together and start mopping. Making a window cleaning solution is just as easy as the floor cleaner above. You can mix together the same ingredients for your floor above or go with an alternative option. Either way, your eyes and nose won’t burn because there is no ammonia like in commercial window cleaners. Someone sick at home? You can wipe down door knobs, phones, faucets or anything really with this homemade disinfectant. This is a great recipe for a general household cleaner to use to clean up spills and wipe down counters. The best part is you can really use this anywhere since there are no harsh chemicals. I like to mix this one in a spray bottle so I have it on hand at all times. Most of us have self cleaning ovens but sadly they don’t get the oven as clean as possible. At least mine doesn’t. So while I still use the self cleaner to get the majority of the over clean, I finish up with this great oven cleaner. With multiple females in the house, I felt like I was buying drain cleaner on a weekly basis to unclog the drains from hair clogs. But no longer. Now I use this home based version of drain cleaner and save a ton of money. There are things you just don’t want to clean. Like ever. A toilet bowl is one of them. Unfortunately it has to be done. Here is a great alternative cleaning product to what you currently use. Let sit for ½ hour, then scrub and flush. If you have stains in your bowl, add borax to remove them. If by chance you still have stains after all of this, check out my post on how to clean toilet rings for some more ideas. If you have ceramic tile in your house, you know that you have to be careful with what you use to clean it. The solution below will clean your ceramic tile fast and is safe to use. Cleaning the bath tub takes a lot of scrubbing. But I’ve found this alternative cleaning product to be very effective in reducing my time spent on my hands and knees scrubbing. Ever stand in the kitchen and wonder were that awful odor is coming from? You search the trash can and the refrigerator but still can’t find it. Then you realize it’s the garbage disposal? Well I have a solution for you. It’s simple to do and it makes your kitchen smell like great. In your bathroom you probably have mildew. We all do. The issue how to actually clean it. I’ve spent countless hours trying various products that don’t work or require me to clean for a long time. Luckily I stumbled across this alternative cleaning product. It gets the job done and I don’t have to scrub for hours. If you want to your furniture to look shiny and new, this alternative cleaning product for wood surfaces is here to help. While it does take a little more work on your end, it does an amazing job. There you have it. Great low cost cleaning product alternatives made from much lower cost ingredients. Plus, there aren’t any unknown chemicals in these. Try them out for yourself. You’ll be pleasantly surprised by their effectiveness. Readers, have you used any of these to clean your house? What were your results? Sweet! I’m so going to look into this more and see what I can make!